Checking a website to make sure it is at peak performance is an essential component of web design and running an online business. However, if you go to check a website you’ll discover you need to use a range of tools and services from a cross-section of different suppliers; so it can be cumbersome and take time. 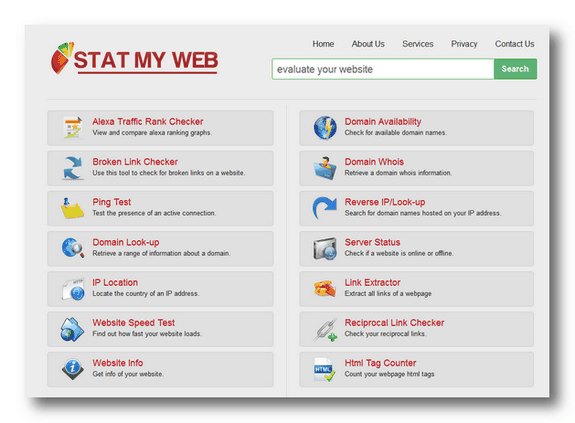 There are, however, some tools which will provide a comprehensive analysis of your website all in one convenient place. To check a website for how well it does in terms of marketing you need to use the Marketing Grader from the HubSpot stable of tools. With Marketing Grader you can get a host of information on how well your site is doing and you are also given precise instructions as to what you need to do in order to improve your score. However, as good as the all-in-one marketing testing that HubSpot can do with your website, there are still plenty of other things you need to check to ensure that your website is working well. These include load times, the reliability of your server and how rapidly your traffic is growing. A great set of tools which performs all these functions – and many more – can be found at Stat My Web. This site has a full range of testing which can be done individually, or by typing in your domain name at the top of the page you can run a battery of tests to check your site. True, you can find the tools in Stat My Web in some obvious places, like Alexa, but they are all available in one page and produce one simple report. In other words, Stat My Web provides convenience. Not knowing the details provided on places like Stat My Web or at Marketing Grader means that you are trying to run your website in the dark. Having analytics data from something like Google Analytics only gives you half the picture. You need to check a website for a host of other factors not covered by analytics software. Using Stat My Web and Marketing Grader means you will have a great deal more information so you can boost your online presence more efficiently. And one other thing – you can use these tools not only to help your own business but to check a website from a competitor…!